So, was Hatshepsut’s great dream to have her burial chamber directly underneath her mortuary temple at Djeser Djeseru i.e. her wonderful temple, now known as Deir el Bahri? 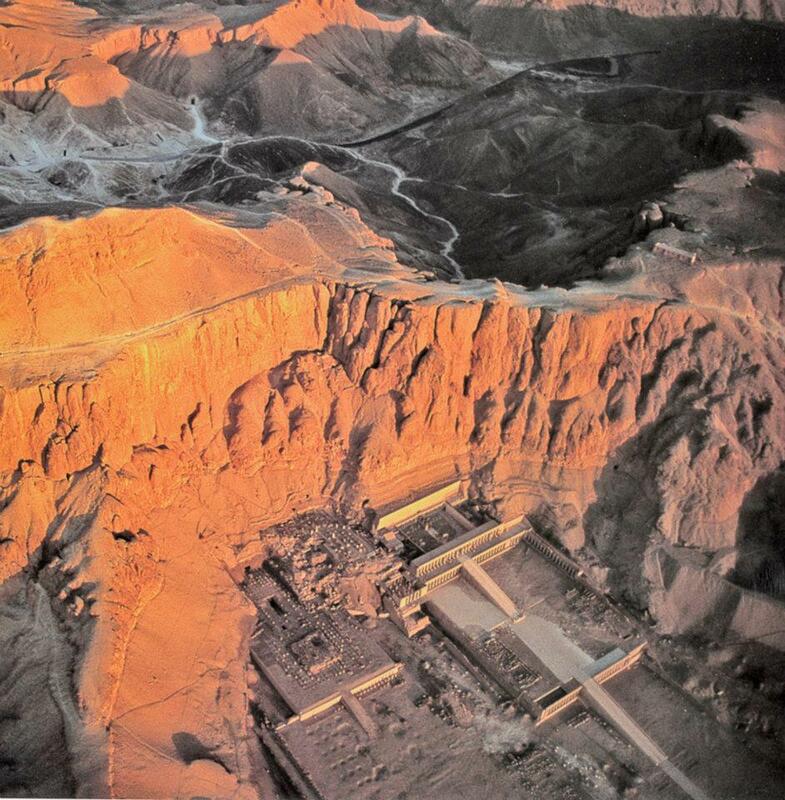 This aerial shot shows Hatshepsut’s temple nestled against the cliff-face, with the Valley of the Kings directly behind it on the other side of the mountain. You an also see the ancient pathways across the clifftop. Her tomb, KV20, has its entrance at the end of a branch leading from the main Valley stem. Had it been dug in a straight line, many believe the burial chamber would have been excavated directly beneath the temple. But sadly the quality of the bedrock was poor. It seems the ancient tomb-builders were forced to spiral away from their original plan. 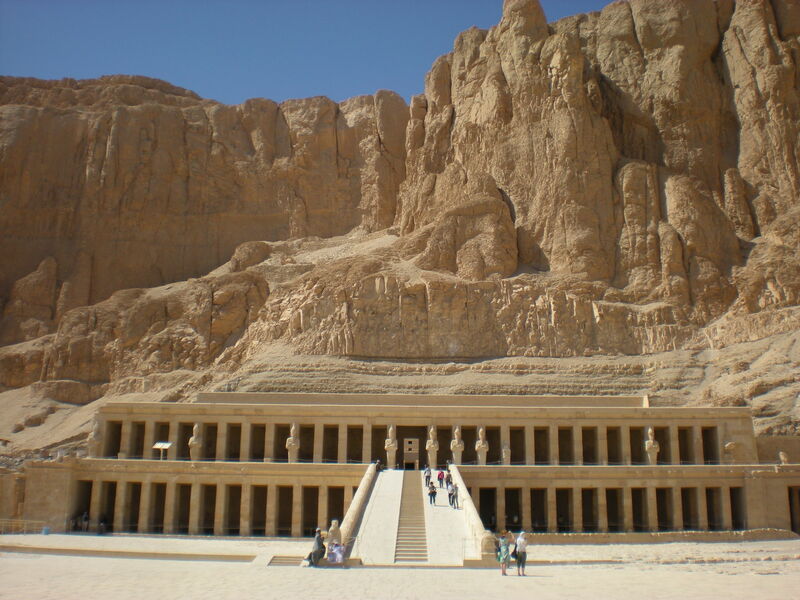 Hatshepsut’s magnificent temple features prominently in all three of my books following Meredith Pink’s Adventures in Egypt. It’s where Merry and Adam first strike up a conversation, and she enlists his help to solve the mysterious puzzle she’s stumbled across in Howard Carter’s house. Howard Carter’s association with Queen-Pharaoh Hatshepsut was a close one. As a young man working for the Egypt Exploration Society, Carter spent five years as an artist recording the wall reliefs in watercolour paintings. Later, as an archaeologist, he was responsible for excavating her tomb, KV20. This was an unenviable task: so hot his wax candles melted and with an atmosphere thick and redolent with centuries of bat droppings. All this provides great material for a writer, and I made good use of it in Carter’s Conundrums. Whether or not Hatshepsut’s temple stands as one of her great triumphs or a thwarted dream, I rate it as possibly the most beautiful of all the ancient Egyptian temples. Posted on February 20, 2013 by Fiona Deal. This entry was posted in Egypt, egyptian fiction and tagged Carter, Deir el-Bahari, egypt, Egypt Exploration Society, Hatshepsut, Howard Carter, Mortuary temple, Valley of the Kings. Bookmark the permalink.